Aborigines Promotions card slated for February 15 dubbed ” Clash of the Titans” with it’s main bout featuring the two time world champion Joseph “King Kong” Agbeko in a defence for his WBO Africa Bantamweight title against Hashimu Zuberi at the Aborigines Beach resort has been rescheduled for April 19. Agbeko 38, (35-5, 26KOs) who is currently ranked number four (4) by the WBO will be making his second defence after defeating Ekow Wilson on a round ten (10) knockout in their clash. Agbeko won the vacant title when he came against the then undefeated Ugandan chap Frank Kiwalabye. Zuberi 23, (15-3, 5KO) set up this clash after defeating a fellow Tanzanian debutant in round three (3) of an eight (8) round contest. Emmanuel Martey (14-0, 10KOs), the WBO Africa Super Middleweight belt holder is also billed on the card for a defence of the title against an opponent to be announced later. John Koudeha 28, (15-1, 12KOs) a Ghanaian based Togolese will also come against Manyi Ibill, 26, (12-2-2, 9KO) in a WBO Africa Middleweight championship. 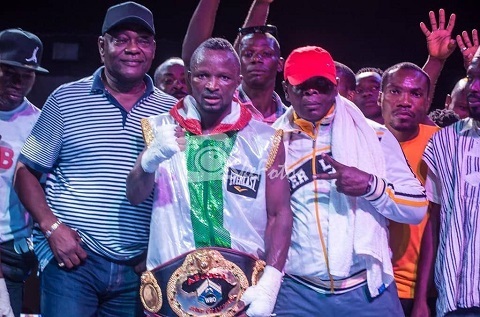 The night will also see a National Super Lightweight title contest between Anama Dotse clashing with Richard Amenfu and Tackie Annan Locking horns with Nathaniel Nukpe.